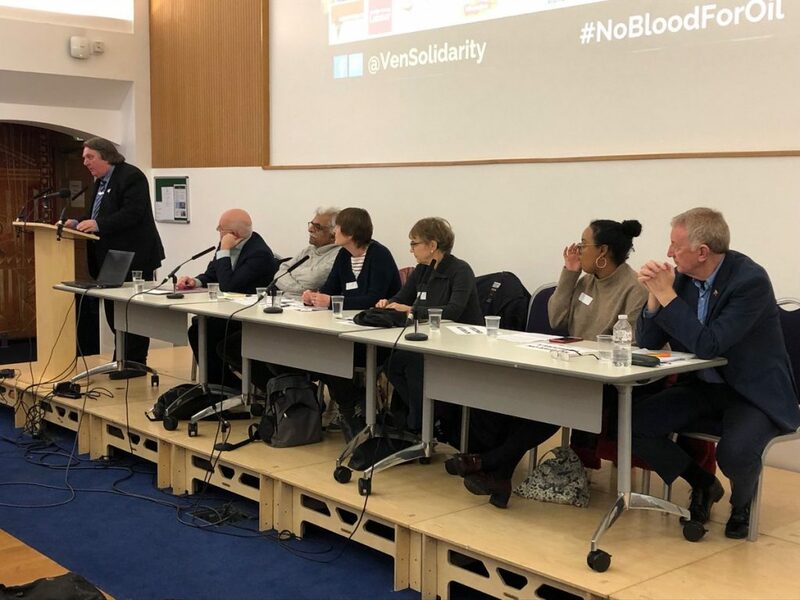 Left to right: Doug Nichols, Tariq Ali, Kate Hudson, Huda Elmi, Colin Burgeon – ⁦Sue Gray in the chair and platform was joined by Christine ⁩Blower. Photo: Adrian Weir. Good evening and thanks for coming out on such a bitterly cold evening here in London. I am Tony Burke, Chair of the Venezuela Solidarity Campaign who called today’s event and I am also speaking on behalf of Unite the Union and Worker’s Uniting, our Global Union. Workers Uniting is the global union – representing more than two million workers in Canada, Ireland, Mexico, the United Kingdom and the United States – formed by UNITE, the United Steelworkers of the US and Canada and the Mexican metals and mining union (Los Mineros), and I bring you the support of Len McCluskey of Unite, Leo Gerard of the United Steelworkers and Napoleon Gomez of Los Minero’s in Mexico. Let’s be clear. Such US-led ‘regime changes’ have been a disaster in other countries in recent years and there’s no reason to believe it would help the people of Venezuela. This is not about democracy or human rights –its about gaining control of the world’s largest proven oil and petroleum reserves. Nor is it about helping the people of Venezuela. Polling suggests the majority of Venezuelans – both pro and anti government – are against tighter US sanctions, which damage the private sector and living standards of ordinary Venezuelans, including the poorest. Extending these further will only make things worse. What is needed in such a situation is dialogue as a way for Venezuela to peacefully resolve its current difficulties as suggested by Mexico, Uruguay and others. Governments internationally should do all they can to support such a dialogue, but instead the Trump administration is introducing sanctions, threatening military intervention and trying for a coup. These actions will not facilitate dialogue, but exacerbate difficulties and divisions. Friends and comrades the last few years have seen a worrying return of the Right-Wing in Latin America with the gains made by progressive leaders across the continent coming under fire, as most exemplified by the far-right winning the Presidency in Brazil. In light of this it’s important to keep up our solidarity and be clear that whatever problems countries like Venezuela face, neo-liberalism and US intervention is not the answer. Indeed, with the right-wing in power, Argentina and Brazil are facing massive public sector layoffs and spending freezes, plus repression of trade unions and social movements. Finally, I’d like to offer some hope in our discussions on Latin America and that is the victory of the left in Mexico, which has led to that government having a pro-dialogue position in Venezuela. What a symbol of change! We stand with the Left and Unions across Latin America, from celebrating victory in Mexico to fighting fascism in Brazil, to working together against illegal ‘regime change’ and for dialogue in Venezuela. Let’s not let there be anymore Pinochet’s in Latin America – and stand clearly with social progress, and self-determination, against Trump’s intervention. This entry was posted in International Trade Unions, Trade Unions, Unite The Union, Workers Uniting. Bookmark the permalink.